Ooh check this out. I found these adorable and great-smelling tins of goodness at the Eumundi Markets this week. 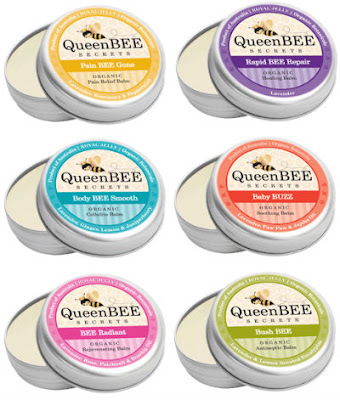 Queen Bee Secrets are a range of healing skin balms made from all-Aussie botanicals, organic beeswax and royal jelly. If the balms are as great as the packaging, then these guys are a no-brainer. 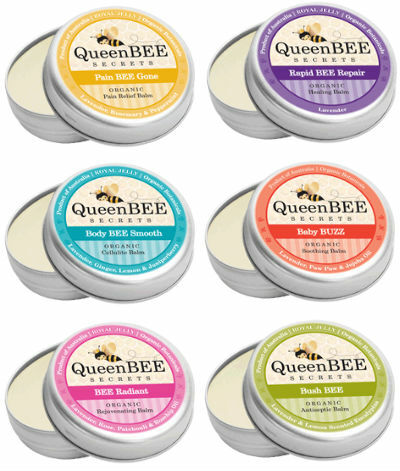 The Queen Bee Secrets range includes Pain BEE Gone (for sore muscles and joints), Rapid BEE Repair (for damaged skin), Body BEE (for skin smoothing), Baby BUZZ (for bub's bum and bumps), BEE Radiant (for moisturising) and Bush BEE (for first aid). I would definitely throw one in my nappy bag for scrapes, mozzie bites, chafes, and boo boos. Based on the Sunshine Coast, Diane Elliot created her range of balms after suffering cancer and looking for a natural way of caring for herself and her family. With a background in Aromatherapy, she established a lavender farm and created nurturing products using the essential oils from the property well as the wonderful beeswax from the bees that live there. You can find Queen Bee Secrets in the online store and at the Eumundi Markets in Queensland. Those busy little bees, whipping up a healing storm! I love products with honey or beeswax in them. Honey has amazing healing properties. These little balms look great, I'll bee sure to look out for them...buzzzzz! the sound a bit like Burts Bees products but more natural and local so much more preferable plus anything with lavender is a winner with me. Nic, you're funny. Maz, I love Burts Bees too. And Di is super-lovely; what a fantastic result to come from a huge challenge in her life.